Happiness doesn't come from drugs, alcohol, having things or anything else we associate with happiness. It is more hard work than you realize, but it is worth it. That's how I happily roll. A friend of mine recently wanted me to write about staying optimistic. I hate plastic bags with the built in zipper closures. I detest dropping things, as I can't pick them up. I abhor when things like the T.V. remote are out of reach. I dislike that I can't get into food wrappers without scissors. Buttons are on my hit list. Round door knobs are my enemy. Curbs, stairs, chairs without arms or seatbelts, muscles that stay tight and the pain that goes with that. These are just a few of my least favorite things. It is probably clear that I, like all people, are not always happy, but that is a common misconception that follows me. Ableism is something I can't control. I echo many of my fellow advocates when I say the world wasn't designed with us in mind. It might be surprising to you that on the whole, most of us are no less happy than the general population. My biggest crisis had nothing to do with my disability and came from being raised by a single mom. My biological father has been absent since I was an infant. I last saw him when I was three, I think. I'm not really sure if that even happened. The maternal side of my family is so close knit, I was able to build a box around his absence and not think about it much. Pandora's box opened when I was in college and had a kidney stone. Mom started doing research on kidney stones. It turned out, my biological father also has a history of having them. In doing that research, I learned that some of my paternal cousins studied history and journalism, just like me. I couldn't stop wondering how much more did I have in common with them, that I didn't acknowledge before and whether or not I had missed opportunities for connection. Combined with my perfectionism, which I have written about, this sent me into a deep emotional tailspin that lasted for about a year and a half. People outside my inner circle might be surprised to hear that, because my grades never dropped and I was able to hide it very well. I am good at putting on a bright face. It was really bad for a while, since I hadn't addressed those issues for over twenty years. There were a lot of questions that I hadn't paid attention to like both sides of my family live in the same areas and for a long time, I was comfortable not engaging with them. During my depression, I wondered if that had been a mistake because both of my paternal grandparents are now deceased. Had I missed that opportunity to get to know them? It is hard to summarize a year worth of therapy sessions. Very long story short, I am recovering from both perfectionism and my family related issues. I eventually decided to tell one of my cousins, who I had attended school with for many years, that we were cousins. I told her via Facebook. We had been friends, but she never knew that we were related, because it made me uncomfortable. One night, we had an unplanned dinner with them. We just happened to be at the same restaurant and decided to eat together. At the end of the night, they told me that they loved me, which made me feel much better about that part of the family, although, my father still doesn't acknowledge my existence. He just skips right over me. I think I have a lot in common with him. I tried to friend him on Facebook, but he has never accepted. It's nice to have at least one connection with the other side of the family. After that, I pretty much hit rock bottom and had to rebuild myself. In my experience, the depression was a lot more debilitating than any of my physical challenges. I'm not a psychologist, but since she asked, I can share some of the things I've learned on my journey. First, friends and family are important. Their actions saved me from myself. They made me go to the counselor and they stayed with me through it all. Now, I monitor myself, as do my supporters. A lot of people now check in and check on me. My mother made me take a stress management class. Those activities and self-exploration helped to further my recovery. I stumbled across that at the right time. It turns out there is a whole new subfield of Psychology called Positive Psychology. I watched the Netflix documentary called "Happy." There are scientifically based activities to foster happiness. The depressing thing about happiness is that, it turns out, according to the scientists, we control only 40 percent of what makes us happy. This means there are going to be naturally sad people. Having said that, the 40 percent we do have can make a big difference in our happiness. I read and still read countless books and listen to happy songs. The scientists have found that all cultures value twenty-four categories of happiness, according to Christopher Peterson. There is an inventory you can take and recommended activities you can do yourself. The website, Greater Good in Action, offers scientifically based activities to improve your happiness that you can also do yourself. I'm not going to tell you what will work for you. I can tell you that one of the interesting things I've learned is that all areas of our lives are connected; mind, body and spirit. When I was depressed, I felt my CP pain more. I don't feel it much, right now, because I am very happy. 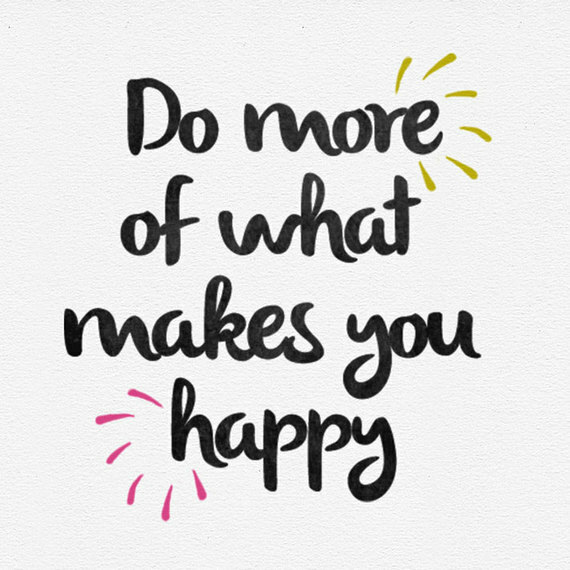 Happiness is a choice and the fact that we can control 40 percent backs this adage up. Happiness doesn't come from drugs, alcohol, having things or anything else we associate with happiness. It is more hard work than you realize, but it is worth it. That's how I happily roll.